After you are married, if something happens to you, your assets will generally pass to your spouse. Therefore, it’s a good idea to think about if you want any of your assets to be passed to your family or elsewhere. In addition, you might consider naming your spouse as your health care power of attorney or financial power of attorney and taking steps to prepare those documents. Bringing a child into your life, perhaps the most momentous life change, raises a million questions and concerns for new parents. An important thing to consider after having a baby is whom you would want to raise your child if something happens to you. In other words, who should be named as the guardian for your minor children in your will? Another idea to consider is whom you would want to take care of your children’s money. Who would help facilitate paying for school or lodging? This can be the same person, but it doesn't have to be — perhaps the person you’re naming as guardian isn’t known to be the best at managing their finances. Review your IRA beneficiary designations and think about what you want to do with your other assets. 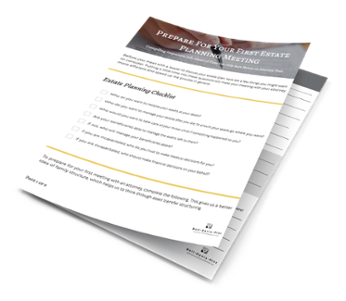 Consider your philanthropic goals, and if your estate plan can help reflect that. Re-examine the designations on both your healthcare power of attorney and power of attorney, and your advanced directive to make sure your appointments are current. Start having conversations with your loved ones about your wishes regarding burial arrangements and cremation. While an unpleasant reality of life, divorce is another time to take a good look at your estate plan. Upon a final divorce, North Carolina law automatically revokes the appointment of your former spouse as executor, and any other provision in favor of your former spouse. You should revisit who was named as your backup executor and confirm that is who you would like to take on that responsibility. This is also a good time to reconsider your durable power of attorney and healthcare power of attorney, as divorce does not revoke the appointments of your agents in those documents. At any stage of life, working with an estate planning attorney will provide you with peace of mind, and make life’s transitions easier and less stressful for your loved ones.